Daring! Eloquent! Forceful! Assertive! Sanguine! Upbeat! These terminologies best describe the persona of Maj Gen (Dr) Gagandeep Bakshi SM, VSM (retd.). His path breaking book Kishtwar Cauldron is an explosive and insightful account of Pakistan’s Proxy War in J&K in general and the Counter-Terrorist (CT) operations in the grim and forbidding killing fields of Kishtwar, in particular. 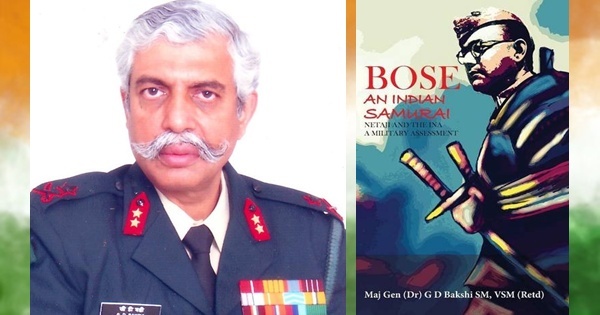 Maj Gen GD Bakshi is most eminently qualified to write about these operations due to his extensive combat experience. He commanded a Company in Counter-Terrorist operations in Punjab. He then commanded his battalion in fierce skirmishes on the LoC in Kargil. He went on to command a Brigade in intense CT operations in Kishtwar. Kishtwar Cauldron is the detailed account of those grim operations. He then moved on to command the reputed Romeo Force Division in concerted Counter-Terrorist operations in the volatile Rajouri and Punch districts of J&K. 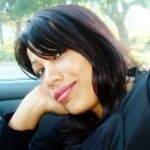 In between these tenures, the officer served in the prestigious Military Operations Directorate at Delhi. Thus he not only personally led these high risk operations in the field but also oversaw their planning at the apex level. He not only provides the doctrinal overview for these operations but goes on to give a blow by blow account of these campaigns and some of the debates and decision-dilemmas they generated. Kishtwar Cauldron highlights one very painful and largely blanked out aspect of these operations – the horrible ethnic cleansing of the Kashmiri Pandits from the valley and how it was blanked out from the media. According to official figures, over 62,000 Kashmiri migrant families have registered with the government. 40,000 of them are registered in Jammu, 20,000 in Delhi, and 2,000 in the rest of India. The book also delves on the true incidents related to ethnic cleansing of Dogras from Kishtwar. To stall talks of the Owen-Dixon Plan to partition Kashmir along the Chenab Valley, the ISI deliberately attempted another ethnic cleansing of the Dogras from Kishtwar. Maj Gen GD Bakshi recounts the harsh struggle to protect the population from such genocidal attacks and the strenuous attempts made to prevent their large scale exodus to Himachal. It was a very taxing struggle but the Indian Army succeeded at last in deterring such attacks. It was Pakistan’s plan to replicate the ‘successful ethnic cleansing of Kashmiri Pandits from Kashmir’ model in Doda Kishtwar region. The Indian Army and the people gave Pakistan a fitting reply by exterminating the terrorists. “Major General (retd) G D Bakshi was appointed sector commander of this region in Oct 2000. He immediately brought situation under control. The tide turned in 2001. 13 Hindus (Dogras) including women and children were mercilessly killed by the terrorists in August 2001 in Kishtwar. General Bakshi took it very seriously and used all the forces under his disposal to track down the terrorists and by September 2001 all the terrorists involved in this massacre were extirpated. There was no massacre of minorities after Sept 2001 in this region.” – writes Neeraj Jadaun in a review of the book in Amazon. According to Kishtwar Cauldron review by Neeraj Jadaun, the story of Doda-Kishtwar region is bit different. Doda before its division used to be a huge district with more than 11,000 sq kms. Now it has an area of 2300 sq km and Kishtwar district has about 7800 sq km. It has rugged and snow peaked mountains. In south it touches HP, in east it touches Kargil district and in west it is bounded by Pir Panjal range. Kashmiri terrorists first came to Doda in 1991 to escape the pressure of Indian Army. Doda region did not have any army presence that time. Soon ISI realized the importance of this region. Terrorists started using its high pastures as safe haven. In 1993, the terrorists carried out the massacre of 14 Hindus in a bus near Hasti near Kishtwar. By 1994 the civilian administration was fully paralyzed and terrorism reached its peak in Doda. 800 Dogra families migrated to HP. Rashtriya Rifles and CRPF were allocated to his region. To prevent mass migration of the Dogra minority, the Village Defence Committee (VDC) was revived and some 330 villages were brought under the protection of VDCs by issuing weapons (mainly archaic but sturdy 303 rifle) to local Hindu youths and the ex servicemen of these villages. The massacres of Dogras resumed after some lull in 1995 and 1996. In July 1998 about 64 Dogras were massacred at three places. There was a kind of cat and mouse game between government and terrorists and Dogras were caught in between. The massacres continued unabated and about 50 Dogras were killed in 2000. From 1993-2001 a total of 229 Dogras were systematically massacred in this region in order to cause ethnic cleansing of this region. The Human Rights body did not utter a single word on this brutal attempt of ethnic cleansing. The most valuable part of this book is the author’s reflections on the lessons learnt. He raises a debate on some seminal issues. Should the Indian Army continue to treat Internal Security as a secondary task to be best avoided? The Chinese Army treats it as one of its tasks on par with conventional operations. He questions the British era principle of Minimal force in the context of the rising lethality of such operations and explores the new concept of Proportional Force. 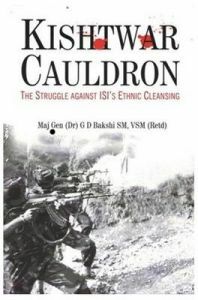 Kishtwar Cauldron is a classic by a scholar warrior who was directly and intimately involved in these operations and is a must read for not only military professionals but also laymen alike. By turns racy and analytical, this is an un-putdownable book at par with Frank Kitson’s classic. Click here to buy Kishtwar Cauldron. 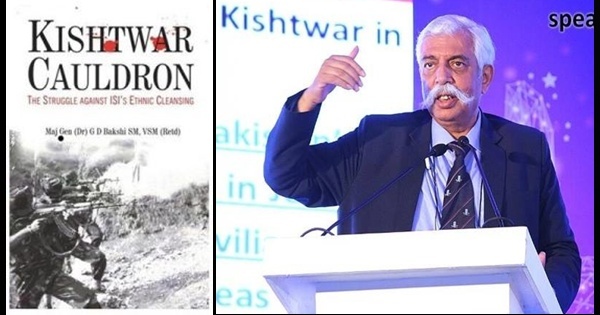 Maj Gen (Dr) G D Bakshi SM, VSM (retd) is the quintessential Scholar- Warrior. He is one of the most combat experienced officers of the Indian Army. He won the VSM while leading his battalion through fierce skirmishes on the LC in Kargil and later won the Sena Medal while leading CT operations in Kishtwar. He later commanded the reputed Romeo Force (Division) in CT operations in Rajouri & Punch. He had two tenures in the prestigious MO Directorate at New Delhi. He taught at the IMA Dehradun, Staff College Wellington and the prestigious National Defense College at New Delhi. A Phd in Strategic studies, he has authored 26 books and over 150 papers. A member of many prestigious think tanks, he appears regularly on national TV debates. Currently, he is Editor Indian Military Review and Senior Security Advisor with the Reliance Industries Ltd.